IN 1998 it was a “Hard Knock Life” and I was thirteen, living in small-time suburban Canada, and that song was the first I’d heard of Jay-Z. I loved that music video and most of the rap and R&B videos I saw in high school, graduating with “Bonnie and Clyde,” and I wanted (without trying at all) to look like the girls in them. Mariah was my favorite, in “Heartbreaker,” when Jay drove a Benz and made millions. Now he drives a Maybach halfway to a billion. That part even my dad could have predicted, you know? But if you’d told me at thirteen that all a skinny suburban-Ontario white girl had to do to get inside a rap video was grow up to be, in 2013, a less-skinny New York white critic wearing a Reformation dress and Acne sandals, standing outside Pace Gallery in Chelsea, name on a list on an iPad, six feet from the Maybach, I would not have understood. I’m not sure I understand now, either. The instructions were: to attend at noon a Jay-Z performance piece Picasso Baby, inspired by Marina Abramović’s MoMA show The Artist Is Present, and filmed for a music video by Mark Romanek. To not take photos or tweet or Instagram. To avoid wearing visible logos, the brand at stake being Jay-Z’s own—and Jay-Z’s only. For half the crowd the last instruction’s easy. This is the no-logo class, or at least that’s the aspiration. Wealth hides money. Pace is cleared of artwork. Dealer Jeanne Greenberg Rohatyn—whose e-mail to Jay-Z with the subject line “Picasso Baby” inspired the song—and her friend, producer Yvonne Force Villareal, have invited hundreds of their most contemporary contemporaries, all dressed for another day out of the office. Artists present include Mickalene Thomas, Marilyn Minter, and Laurie Simmons. Judd Apatow is carrying a galley of the new Andre Dubus III. RoseLee Goldberg is adorable. Bill Powers has a powder-blue Vespa, and Jon Caramanica, the New York Times music critic, is late for a podcast. 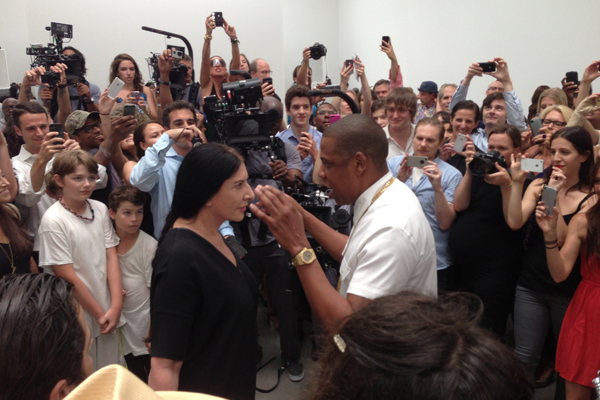 Jay-Z and Marina Abramović in Picasso Baby. The first to go up is a fan in a pink bandanna. Jay-Z strolls out, takes a sip of applause, and asks how she’s doing. She says, “Congratulations.” He asks, “For what?” When he raps at her she raps back. Soon we’ll all know the lyrics too, and not because the song is so good (“I feel like I don’t get it,” I tell Caramanica, “or like maybe I’m not hearing the whole thing.” He says, “No, you are.”) but because Jay-Z is having so much fun. The difference between a performer and a performance artist: The former makes you at ease, and the latter doesn’t. Jay-Z is a performer to the max. For six hours, everyone can pretend there are no differences. In the audience, three white women check their wristwatches. “This is cool, right?” says the mom whose watch is Hermès. Her brunette friend nods, not too eagerly. “We’ll stay for another half an hour,” says the blonde. Someone is looking for Adam Driver. “Adam Driver? Where’s Adam Driver?” yells a production guy in a gray T-shirt. “I need an Adam Driver!” After five minutes, Adam Driver is found to be standing in the audience, making largely recalcitrant hand gestures. Adam Driver does not want to do this. The production guy insists. Adam Driver resists. Finally, Adam Driver is moved to the front of line. His face looks very sorry. In front of Jay-Z, Adam Driver does his best appropriation of Lawrence Weiner. I like Adam Driver. The minutes I like most, though, are when something happens to make “Picasso Baby” stop, maybe the crew takes a break. Jay-Z takes a seat and invites others to take the stage. A ballerina does high kicks in high-tops. A girl with Mariah skin sings En Vogue. I know this won’t be in the music video, but it is the thing that makes me feel like music is happening. As someone whispers of Marina’s arrival, I leave. Well. I guess there wasn’t room for “promised liberation from the large-scale systemic oppression of the state,” so sure, “good fortune” it is. Good fortune is why we’re here, dressed as ourselves, volunteering our affective labor in exchange for a new piece of history, except it’s also the same old, the players changing while the game stays the same. The prize is still the white cube, the White House, the white page that absorbs all the difference. Or tries. Last year Jay-Z and Kanye West put up for auction the 2004 “Otis” Maybach they crashed in Spike Jonze’s music video for “HAM.” This totaled car—or, as it would be called were it made by a guy with an MFA, “sculpture”—sold for exactly $60,000 at Phillips de Pury, one of the most prestigious money houses in the art world. And yet. In the car world you call that a loss.